ConcealedCarry.com provides various NRA Firearm Training Classes and Utah certified Concealed Carry Classes. Our classes can help prepare students to apply for concealed weapon permits and firearm licenses for many states including New Hampshire, Maine, Connecticut, Virginia, Pennsylvania, and Colorado, Utah, Florida, Arizona, New York and others. Our instructors are all NRA and Utah BCI certified. Please view our CCW Class Schedule below. Request Private Classes and read answers to frequently asked questions by using the links above. Now teaching Multi-State Concealed Carry Classes & NRA Courses in Manhattan, Long Island, throughout the State of New York, & in Your Own Home! EVERYTHING Is Included in Our Multi-State CCW Classes to obtain a Utah permit. ($67 State Fee must accompany each application) Our Multi-State class also qualifies for the Florida and Arizona applications. Ask your instructor for more details or contact us. Students do need to bring a photocopy of their drivers license and a passport quality photo to the Multi-State CCW Class. If you have been considering getting a Concealed Carry Permit, now is the time to act. Currently the Utah non-resident CCW Permit is the MOST HONORED permit in all the nation, valid in 33 states and counting. 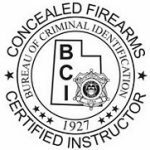 Our Concealed Carry Instructors are certified by the Utah Bureau of Criminal Identification to teach Utah Concealed Carry Permit Classes and by the National Rifle Association (NRA) to teach select NRA classes. Each instructor uses a uniform curriculum that covers vital Utah CCW info in addition to the state minimums. Learn about each instructors individual qualifications by visiting their profile page. Class costs vary depending on which course you are taking. Please click on classes listed in our class schedule to see specific costs. If applying for a Utah or Florida permit you will need to bring the State fees to the class to be included with your paperwork. Get the rest of your questions about NYPD and New York Concealed Carry answered by visiting our Frequently Asked Questions page. Watch Educational Videos and Browse our Other Resources on the Resource Page.